to start preparing your meads, ciders, and wines! Four judges with provide you with detailed evaluation comments. awards will be presented for each of the 11 categories. 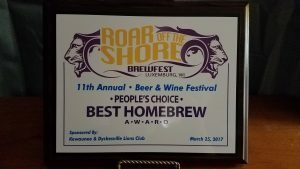 We took home the Roar Off The Shore Peoples Choice Award! 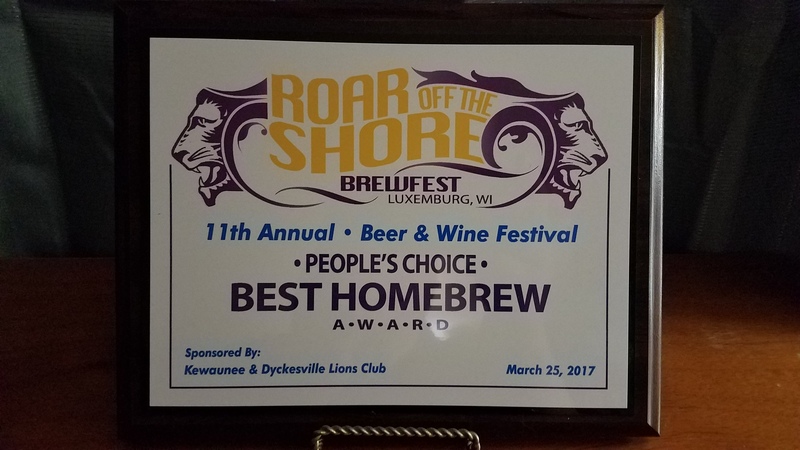 Thanks to all who participated and kudos to the Kewaunee and Dyckesville Lions Club Roar Off The Shore planning committee for organizing another successful brewfest. We found out that next years event will be Saturday, March 24th 2018. Here are the results from the competition at Lion’s Tail Brewing Co. in Neenah, WI. Out of a total 68 entries these are the top 10. Congrats. We would like to wish everyone a SAFE and happy St. Patrick’s day. Roar Off The Shore Brewfest is coming up in a couple of weeks, always a fun time there. Check here for details. Our next club business meeting will be at Ned Kelly’s on Apr. 1st (not fooling about that). Time and address can be found here. Come on down and check out their new 100 tap system if you have not already. Rackers members receive a $2 discount on all tap beer (must show membership card for discount), there are some exceptions and they will be noted here. Also, the Titletown Open is just over a month away. Entries must be received by April 20th at noon for all drop off locations. For the serious procrastinator, or the beer that needs just a little more time, walk in registration is available from 5 p.m. to 8 p.m. at the Titletown Taproom Friday, April 21st. We have another member benefit! Head on over to https://foodvacbags.com/ to get your 5% discount on vacuum seal bags. They are great for storing hops, grains, and other brewing supplies long term. Our bags work on any standard vacuum sealer machine – and we sell the sealer machines as well. Our prices are low already, but we are happy to offer another 5% off to your home brew club members. Thanks to Dan H. for passing this along. 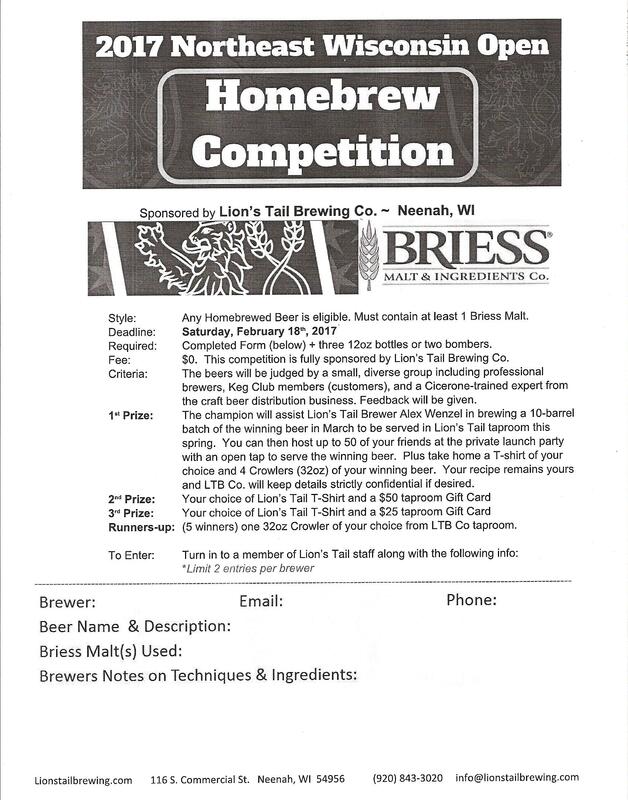 Lion’s Tail Brewing Co. is having a Briess Homebrewing competition. Due Date is February 18th. Noble Roots Brewing Co. Opening March 2nd! Marvin and Alex are two of our club members that have made the leap to professional brewing. It is with enormous pleasure that we announce Noble Roots Brewing Company will open for business on Thursday, March 2, 2017 at 4PM. We’ll also be open on the following Friday and Saturday, so mark your calendars and plan on swinging by for a beer or three. We can’t thank you enough for the support we’ve received to this point, and your patience as we work toward opening our doors to the community. Check back here for another exciting announcement this weekend (intentionally vague), and over the next few weeks as we preview our beers, launch our website, and tell you more about what to expect on your visit to the taproom. Cheers! You can follow them on Facebook and when their website is launched we will post a link. Can’t wait to have a couple in the taproom! 35 Years of Homebrewing in Northeast Wisconsin! While digging around in the archives this old graphic was unearthed. The name may have been changed in the past but our little club has been in existence for the last 35 years. That’s a pretty big deal! Thanks to all the members, past and current, that have kept the club going and brought us to where we are today. Caps off to you! (Bottle caps that is.) Cheers! We have a busy week ahead of us. Registration for The 2017 Titletown Open begins Feb. 1st so make sure to get your entries ready. You do have some time yet, so there is no need to panic. It looks like the entry deadline is April 21st. The February business meeting is at The Titletown depot upstairs this Saturday Feb. 4th at 1p.m. Check your email later this week, the location could change if the room is booked. I will try to keep this updated. The Ingredient of the month is Oats, so make sure to bring your homemade beverage in which oats of some form were used. As always, our business meetings are open to the public, so feel free to stop by and sample or just have a chat. And finally, the Fon du Lac Brewfest is this Saturday Feb. 4th, 5 – 9p.m. Some of our club members will be there to serve up some delicious homebrews, and I believe some are going solely to attend and sample the various options. If you must travel, a designated driver or a night at the inn is highly recommended.